Peter Sallis was best known as the mild-mannered Norman Clegg in Last of the Summer Wine. By the time he first appeared in the role he had already carved out a distinguished career in the theatre and on television. His role as the flat-capped philosopher made him the longest-serving cast member of the much-loved series. And he reached an even wider audience as the voice of Wallace, the cheese-loving character in the animated series, Wallace and Gromit. 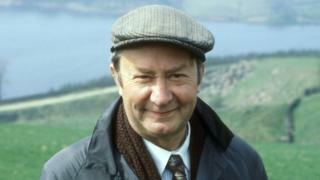 Peter Sallis was born on 1 February 1921 in Twickenham, Middlesex. After attending Minchenden Grammar School in Southgate, north London, where the family had moved, he emulated his father and went to work in a bank. The acting bug first struck during his wartime service in the RAF, when he was asked to play the lead role in an amateur production of Noel Coward's play Hay Fever. "Acting is a matter of instinct," he later said when appearing on Desert Island Discs. "As soon as I was on the stage I just felt so at home." When hostilities ceased he enrolled at the Royal Academy of Dramatic Art (Rada). His first professional appearance came in 1946 and for the next six decades he was rarely out of work. Throughout the 1950s he made a name for himself as a reliable character actor playing everything from Shakespeare to Chekhov. His first play with a star cast was a production of Three Sisters, where he appeared alongside Ralph Richardson and Celia Johnson. He had film roles in Anastasia, The VIPs and Wuthering Heights, but it was for his television work that he was better known. He had already acted in two TV plays by writer Roy Clarke, in one playing a transvestite, before landing the role of Clegg in a Comedy Playhouse episode entitled Of Funerals and Fish. This was successful enough for the BBC to commission a series with the revised title Last of the Summer Wine. Surprisingly, given its later success, the first series was not well received by either audiences or critics. Sallis recalled that filming of the early episodes was enlivened by off-screen arguments between his fellow actors Michael Bates and Bill Owen. "Michael Bates was somewhere to the right of Margaret Thatcher," he said. "And Bill Owen was somewhere to the left of Lenin. It was all incomprehensible to me as I'd never had a political thought in my life." The series sparked an appreciation society and a deluge of tourists to the Yorkshire village where it was filmed. Sallis said, "You would not find me getting up to anything crazy that Clegg gets up to, but I have been very lucky to be a part of it all." As well as Summer Wine, Sallis appeared in the Pallisers and The Diary of Samuel Pepys. In addition, he wrote a stage play, End of Term, and also a handful of radio plays. Despite calling himself "only mildly well-known", after 30 years of playing Clegg, Sallis's face was one of the most familiar on British television. And in 1992 his voice became recognisable across the world, when his distinctive tones graced the character of Wallace in Nick Park's celebrated animation films. As one half of Wallace and Gromit, he appeared in such modern classics as The Wrong Trousers and A Close Shave. Asked for the inspiration behind Wallace, Nick Park called Sallis his automatic choice and explained how the actor had even helped influence the character's face. He said: "There was something about his voice that somehow insisted I make Wallace's mouth really wide to get it around the syllables." Peter Sallis considered himself very fortunate to be in the hands of talented scriptwriters. But his own gentle manner and natural timing certainly helped create comic characters of enduring and wide-ranging appeal. It was with the mild-mannered Clegg that he felt most at home. "I am like him in many ways. I am fairly retiring and do not like to be the centre of attention. I think I'm well cast."